So David Suzuki’s next ‘Nature Challenge’ is apparently challenging students to determine if there isn’t some “legal way of throwing our so-called leaders into jail because what they’re doing [about climate change] is a criminal act”, to quote the National Post (Feb 7, 2008). It appears that a religious fervor for protecting nature has transformed Canada’s leading environmentalist into an emotional bully intolerant of anyone, including other scientists, who don’t see things his way. Over the years, I’ve heard and read statements by David Suzuki that are too often misleading or incorrect, especially about climate. He, and many like him, claim natural events are unnatural thus guaranteeing that they appear right. What he conveniently overlooks, and may have learned had he remained a scientist rather than becoming an activist, is that nature and climate frequently change dramatically and in very short time periods. Suzuki gets away with this misinterpretation by fully exploiting the false authority of his claimed and cultivated position as a scientist and environmentalist. He does this despite the fact that he deliberately abandoned his university research position in the 1980s and has no more qualifications as an environmentalist than many of us. 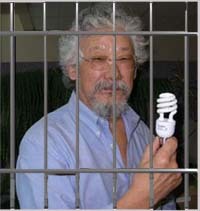 Suzuki’s image is being increasingly tarnished as evidence accumulates against his positions and statements. This was bound to happen with climate because he ignores the standard scientific method, which tries to disprove hypotheses. As Richard Lindzen said about the hypothesis that human addition of CO2 would cause significant global warming; the consensus was reached before the research had even begun. Despite personal attacks and a campaign of disinformation by alarmists, it is science that is destroying the human-caused climate change hypothesis. The disinformation of alarmists, Suzuki included, has gone through many phases–the now familiar ‘consensus’ argument, the ad hominem attacks (’climate deniers’, ‘climate criminals’, ‘international outlaws’, etc.) to presenting misinformation to political leaders. The latest position is that ‘the science is settled’. In February of last year, Suzuki stormed out of an AM640 Toronto radio interview when interviewer, John Oakley, made the accurate observation that global warming science is not a “totally settled issue.” Besides Suzuki’s aggressive behavior, his promotion of certainty in a field scientists understand to be immature, is counterproductive to climate research. If the science is settled then why is there literally a deluge of scientific papers coming out on the topic? If the science is settled, then this all must be an enormous waste of money. Suzuki raised the spin to a professional level when he teamed up with James Hoggan of Hoggan and Associates, one of Canada’s largest public relations firms. According to Hoggan’s Web site, “Hoggan has provided strategic communications services to the DSF [David Suzuki Foundation] for more than 15 years, providing communications advice on salmon farming, climate change, forest preservation and international conservation projects. It would be hard to imagine a closer relationship between supposedly distinct entities that that which exists between Hoggan and Suzuki. Hoggan and Associates list the David Suzuki Foundation as one of their “Research Sponsors” and Hoggan himself has served on the Board of the DSF for the past 11 years, now even replacing Suzuki as Chair of the Foundation. According to the DSF 2006 annual report, Hoggan and Associates is a large financial donor to the Suzuki Foundation and Hoggan has personally arranged “a future gift” to the society. Not surprisingly, Suzuki regularly boosts Hoggan’s global warming projects in the media and Hoggan is quick to use his project to attack those of us who dare disagree with Suzuki. That Hoggan’s project has been funded by an Alberta-based lawyer who has pleaded guilty to multi-million dollar money laundering charges seems to bother no one.